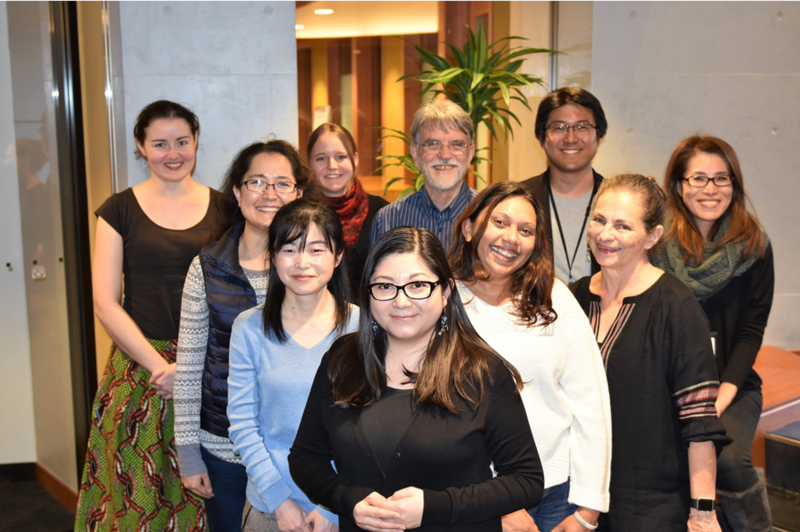 From left to right: Nicola H Guy medical student, New Zealand; Nilupaer Abudukeyoumu, graduate student; Bianca Sieveritz, graduate student; Prof Gordon Arbuthnott; Mr Jun-Seok Lee, research Intern; Ms Hiroko Chinone, research unit administrator; Ms Yoko Nakano, technician; Dr Emmanuell Sandrine Albert, postgraduate fellow; Dr. Marianela Garcia-Munoz, group leader; Dr. Teresa Hernández-Flores postgraduate fellow. Violeta Lopez-Huerta left for MIT, Omar Jaidar went to Stanford and I became Dean of Faculty Affairs. In a sense, it was the end of an era with some data published, other results presented at conferences, and others still to be published; of course, a task held-up by Omar’s and Violeta’s departure from Unit and my own immersion in the administration of the University for two years. During the time of this report, nonetheless, we started two new investigations, wrote some of our developing ideas as literature reviews and presented the initial results at scientific meetings. Indeed a strong effort was made to keep the wheels turning. Prof. Sile Nic Chormaic, OIST Graduate University, Light-matter Interactions Unit. Bringing together three papers we had published recently, I presented a poster to the II. International Conference on Deep Brain Stimulation (DBS) in Dusseldorf, Germany, and wrote a summary review about the idea that the symptoms of Parkinsonism might have a cortical origin. Although the cause of Parkinsonism is certainly the loss of dopamine the source of the behavioral difficulties seem to involve cortical malfunctions since cures for the symptoms all change the power in the Beta range (15-30Hz) in the patients’ electroencephalogram. In our animal studies, we had shown that DBS antidromically drives cortical cells and disrupts the Beta rhythm in animals lacking dopamine in the striatum. Figure 1: Diagram reproduced with permission from our paper in JAMA Neurology. Summarizes the idea that DBS might act by antidromic activation of layer V neurons in cortex. The raster plots above the drawing illustrate the activity of 4 cells from 3 states of the animal. Normal – is just the recording electrode implanted. Parkinsonian – was taken three weeks after the 6-OH-dopamine injection had destroyed the dopamine cells on that side of the brain. Parkinsonian+DBS shows the return of a more normal pattern during stimulation. 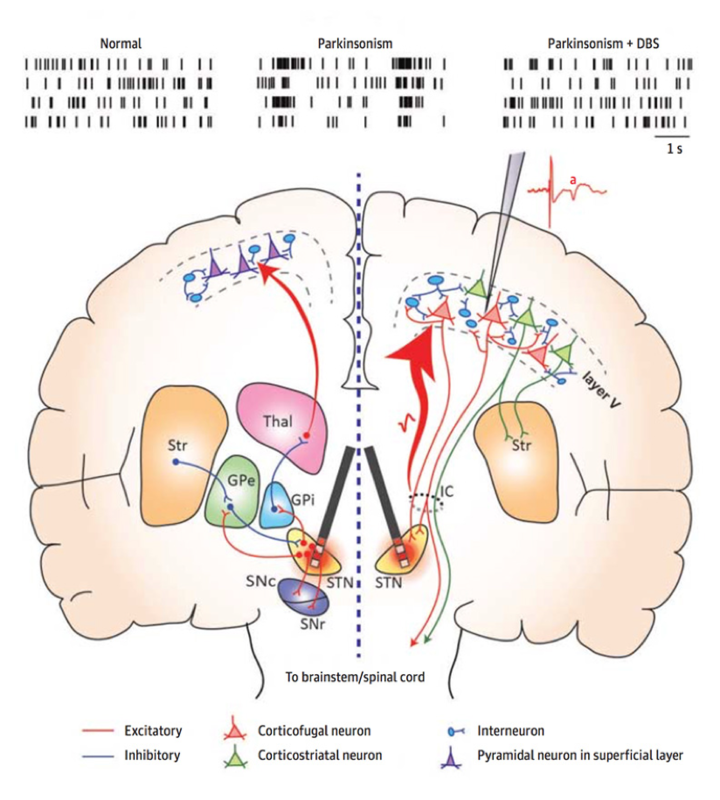 The bunches of action potentials in the ‘Parkinsonian’ state are in rhythm with the increased Beta power of the EEG. Reproduced with permission from (Li et al., JAMA Neurology 2014 Volume 71, Number 1, pp100-103) Copyright© American Medical Association. All rights reserved. Within striatum we have been exploring the effects of destroying Cholinergic Interneurons in the part of the striatum associated with forelimb skill. To our surprise the toxin ChAT-saponin destroys the cell bodies but when we stained for the vesicular Acetyl Choline Transporter vAChT the terminals were still present. We stereologically counted the terminals and found that destroying the cells led to a net increase in terminals that slowly reduced back to pre-lesion levels at 6 weeks after the toxin injection. It seems that the terminals are being replaced by the surviving cells since the part of the striatum in which we made the lesion is poorly innervated by the other source of Cholinergic terminals in striatum; the pedunculo-pontine nucleus. We could find no evidence that any change in their innervation was present in our operated animals. 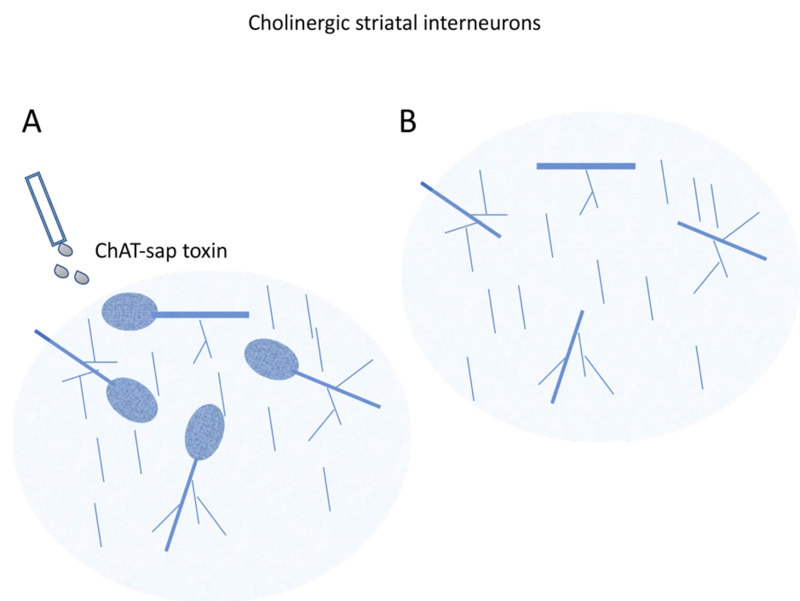 Figure 2: Although injections of ChAT-sap kills cells, the terminals that are thought to be the source of acetylcholine for the striatum are not reduced in number. The drawings illustrate the idea and the photomicrographs illustrate results from a pair of animals. Arbuthnott, G.W. & Garcia-Munoz, M. (2017) Are the Symptoms of Parkinsonism Cortical in Origin? Computational and Structural Biotechnology Journal, 15, 21-25. Lopez-Huerta, V.G., Nakano, Y., Bausenwein, J., Jaidar, O., Lazarus, M., Cherassse, Y., Garcia-Munoz, M. & Arbuthnott, G. (2016) The neostriatum: two entities, one structure? Brain structure & function, 221, 1737-1749. Mekhail, S.P., Arbuthnott, G. & Chormaic, S.N. (2016) Advances in Fibre Microendoscopy for Neuronal Imaging. Optical Data Processing and Storage, 2. Nedelescu, H., Chowdhury, T.G., Wable, G.S., Arbuthnott, G. & Aoki, C. (2017) Cerebellar sub-divisions differ in exercise-induced plasticity of noradrenergic axons and in their association with resilience to activity-based anorexia. Brain structure & function, 222, 317-339. Arbuthnott, G. W. & Garcia Munoz, M. Could Parkinson’s disease symptoms depend on a cortical malfunction Movement Disorders Annual Meeting 11, Amsterdam, Netherlands (2016). Arbuthnott, G. W. & Garcia Munoz, M. Could Parkinson’s disease symptoms depend on a cortical malfunction II International Conference on Deep Brain Stimulation (DBS) Dusseldorf, Germany, From March 15-17 (2016). Lopez Huerta, V. G. Jaidar, O. Nakano, Y. Garcia Munoz, M. & Arbuthnott, G. W. Striosomes as 'private' compartment within striatum Dopamine 2016 Vienna, Austria, From September 5-8 (2016). Abudukeyoumu, N. Nakano, Y. Garcia-Munoz, M. & Arbuthnott, G. W. Partial Deletion of Cholinergic Interneurons from Dorsolateral Striatum and its Role in Behavioral Responses. International Basal Ganglia Society Merida, Mexico, From March 27-30 2017. Hernandez Flores, T. Jaidar, O. Nakano, Y. Garcia Munoz, M. & Arbuthnott, G. W. Correlated neuronal activity in the mouse motor cortex. International Basal Ganglia Society Merida, Mexico, From March 27-30 2017.